Learning and Development initiatives contribute greatly to keeping the employees happy, engaged, and empowered by giving them the assurance that the company is invested in their growth aspirations. With millennials making up 75% of the workforce today, we have to take into account that 87% of this segment believes professional development and career growth is very important to them. Ceridian reports that 91% of top performing employees rate learning and development opportunities as very important. And then there is the statistic that shows that companies that invest in employee training and learning and development initiatives enjoy 24% higher profit margins as against companies who don’t. Learner experience is about providing the opportunity to learn and grow through avenues that excite and engage learners. A great learning and development strategy doesn’t just ensure that your employees remain content with their jobs. It also ensures that they remain committed, enthusiastic, involved, and ultimately, productive in their job roles. 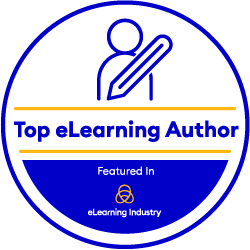 Those organizations that understand this are focusing on actively creating a culture of learning and have effectively employed eLearning to drive the same. However, worrying trends are also visible. According to reports, the current average completion rate for MOOC’s averages out to only 15%. Other studies reveal that the dropout rates for online courses stand as high as 70%. Given the investment that goes into the learning initiatives, it is time that we re-evaluate the way learning is disseminated. Organizations are realizing that they need to amplify their learning initiatives to engage employees, improve productivity, and close the skills gap. However, we need to take a close look at how learning is being delivered today. Instead of an administration-centric approach, we need to adopt a learner-centric approach to achieve the desired results from these initiatives. This can only be achieved when we begin to focus on learning experiences to enable continuous learning. Training and development initiatives thus must move beyond the traditional PowerPoint presentations, eBooks, and generic training videos. We need to now look at evaluating ways that help the learner become the driver of their learning and development. For this, it is imperative to focus on learning experiences and evaluate how to enhance them to compel the users to complete courses, improve training outcomes, and drive knowledge retention. Learning experiences have to become absolutely frictionless. In a world ruled by consumer-grade experiences, it is unfair to expect an individual employee to like something that will be challenging to use. Learning Management Systems thus have to be designed keeping the end user’s standards in mind and to create a frictionless experience. The principle of ‘don’t make me think’ also plays into designing great learning experiences. LMS’s have to focus heavily on enhancing end-user satisfaction. Factoring in things like accessibility, usability, and fun in the interaction between the course and the user are some good starting points. We have to start looking at the learner experience with the LMS in the same lens as User Experience Design in product development. The UI thus has to support and enhance learning outcomes, and learners have to be kept at the core of the experience. Cognitive elements have to be employed suitably to enhance learner retention and concept application. Understanding the learners, their job roles, specific needs, assessing and understanding their existing skill sets and knowledge levels helps in taking the learner-centric approach. Observing patterns such as how they prefer to consume information, the devices they like to use to access information are also important points of consideration. The core has to be to create meaningful learning experiences that help learners perform their roles better. The millennials, for example, are extremely comfortable with technology. Designing mobile learning experiences for them will yield better results than classroom training or learning delivered through one-way lectures. This age of ‘anytime, anywhere’ also has to drive learner experience. A diverse workforce, changing everyday needs, and distributed teams and employees, are reason enough for learning solution providers to ensure that they drive learning experiences that are easily accessible. Learning must be continuous and enabling. This means, if a salesperson has to access a certain piece of information during a meeting, they can easily do so from their learning repository. Thus, focusing on mobility becomes critical in driving learner experience. The LMS in use simply cannot drive learning experiences if it has a steep learning curve. The learners should be able to navigate the LMS easily to fulfil their training needs and immediate objectives. If learners log in to the LMS and have to ask too many questions, then that’s a problem that needs to be addressed immediately. Employing gamification and interactive elements such as AR and VR organically increase the ‘fun’ element of the learning program. It also helps drive richer learning experiences by engaging the users in an appealing manner. This helps them learn faster and enables better learning outcomes. The new learner experience demands that eLearning has to evolve from ‘telling’ to making the learner feel more ‘involved’. We have to move away from providing isolated learning experiences that lead to learner attrition. By focusing on the elements that drive learning experiences, we can curate learning programs that fill the existing knowledge gaps and can enable continuous learning, anywhere, anytime. Most importantly, by focusing on learner experience, we can design a learning strategy that the learners would actually want to be a part of. icons, infographics, etc., roll-overs can be found at this level. This level is more audio-driven where the learner does a little more than just watch, read or navigate the learning material here and can associate with the learning conditions through “problem areas” employing interactive assets such as movement, sight, and sound. The navigation in this interactivity level expands to glossaries and links to external resources and often has exercised such as quizzes, identification components, drag and drop, matching, etc. At eNyota we strive to help deliver eLearning that makes a difference. Our courses are designed for the learners first. Ensuring learner experience is at the core of your course helps in a successful training initiative. Try adding a little animation or interactivity to your important topics and watch how learners respond with greater interest. This is the true essence of learner experience and we know how to deliver this. Reach out to us at contactus@enyotalearning.com or click here to register yourself for a callback. We assure you it’s worth it.